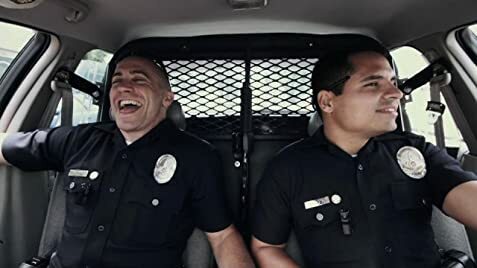 As part of their training, Jake Gyllenhaal and Michael Peña spent five months doing 12-hour ride-alongs with on-duty LAPD officers. During Gyllenhaal's first ride-along, he witnessed a murder. While running down an alley in the movie's final minutes, Taylor and Zavala pass a child's ride-on car shaped like Lightning McQueen from Cars (2006). Moments later, they are shown approaching the same car. This film is dedicated to the men and women of the law enforcement community who face danger daily on our behalf. It is especially dedicated to our fallen heroes who have made the ultimate sacrifice in the line of duty. This is for all that fight evil so we may not know it. God bless you all.